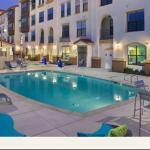 The Tuscany 148 offers accommodation in Lawrence 8 km from San Jose and 43 km from Santa Cruz. The air-conditioned unit is 41 km from Half Moon Bay. There is a seating area a dining area and a kitchen complete with a dishwasher an oven and a microwave. Towels and bed linen are offered in this self-catering accommodation. Other facilities at The Tuscany 148 include a fitness centre. Palo Alto is 19 km from The Tuscany 148 while San Mateo is 36 km away. Mineta San Jose International Airport is 6 km from the property.